US President Donald Trump seemed to shift gear on Syria again this week, warning against a pending government offensive against the last rebel stronghold, in the north-western province of Idlib. Such a "reckless" attack by the regime of Bashar al-Assad and its Russian and Iranian allies, he tweeted, would be a "grave humanitarian mistake" that could kill "hundreds of thousands of people". It would make the world and the US "very, very angry", Mr Trump added later. This came after months of signalling that he was fed up with US engagement in Syria: in April, he began talking about bringing American troops home, and last week, he cancelled $230m (£178m) earmarked for repairing war damage in the country. So was the Idlib intervention just an impulsive tweet, or did it mark a change in strategy? On the one hand, Mr Trump's comments sounded similar to the way he has responded to chemical weapons attacks that have twice led to limited US air strikes on Syrian regime targets. In those cases, he reacted emotionally to the disturbing images of children asphyxiated by poison gas. He was also eager to better his predecessor, Barack Obama, who has been criticised for drawing a red line on Syria's use of chemical weapons and then failing to hold to it. 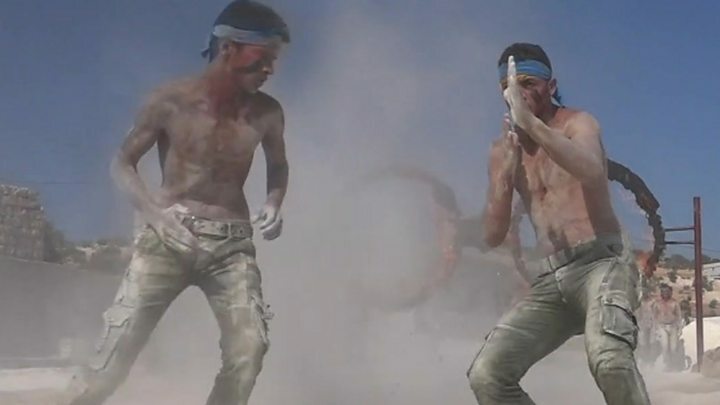 And a focus on chemical weapons has been the centrepiece of a co-ordinated call across the administration, with officials threatening "very strong" action if they were used to retake Idlib. But some Syria experts see something more strategic at play. "The crisis in Idlib is a devil's dilemma for the Trump administration," says Middle East military analyst Nicholas Heras, "and how it responds will determine the success or failure of a new Syria policy." The dilemma is that Idlib shelters some three million people, more than a third of whom fled the conflict in other parts of Syria and have nowhere left to run. It is also a hotbed of the armed opposition, dominated by Islamist militants, the most powerful of which is said to have links to al-Qaeda. Russia wants to get rid of these "terrorists", who launch drone attacks on its nearby airbase. So does the US. Turkey, which has backed some of the rebel forces in Idlib, is afraid an all-out offensive against them would drive a massive destabilising wave of refugees north towards the Turkish border. So is the US, and Europe, where many of the refugees might end up. Senior officials, like Secretary of State Mike Pompeo and Chairman of the Joint Chiefs of Staff Joseph Dunford, are therefore urging Turkey and Russia to reach a compromise that would involve a more narrowly tailored counter-terrorism operation. Russian air power could ensure a Syrian victory, but Mr Heras, who is with the Center for a New American Security, argues Mr Trump's warnings are part of an attempt across the administration to try to strengthen Turkey's hand. More broadly, administration officials are again speaking about an indefinite troop commitment in Syria, aimed not only at ensuring the defeat of the Islamic State (IS) group, but as leverage to help shape a political settlement that would stabilise Syria, and to roll back Iran's influence in the country. This is not a new strategy, it is the one that was laid out by the former secretary of state, Rex Tillerson, in January and was subsequently upended by Mr Trump's calls for a quick exit. The president still sees Syria simply through the prism of defeating IS, according to Randa Slim, who leads unofficial dialogues on the Syria conflict for the Middle East Institute. But, she says, his officials have convinced him the fight against the group is not over yet. "I'm hearing that his call for a withdrawal from Syria has been shelved," she says. That is because he has been told IS will be able to return if he pulls the troops out too soon, as Islamist militants did in Iraq after Mr Obama ended America's military deployment there. "You don't want to be the Obama of Syria, that's the hook being used to keep him on board," she says. In the context of this overall strategy, the administration sees some value in preventing the Assad regime from gaining complete control of Idlib, which would greatly increase its leverage, Ms Slim told me. But "all of this is contingent on the president staying the course long-term", she says, and he can change "minute to minute". Mr Pompeo has signalled greater engagement by appointing a new state department Syria team headed by a "special representative for Syria engagement", Ambassador James Jeffery. Mr Jeffrey was sent to the region this week to press the case that an Idlib offensive would escalate the Syria crisis, and to convince allies that the US is still in the game. "We're not in a hurry to pull out," Ambassador Jeffrey told reporters on his return. How much difference that will make to their calculations is an open question, given that Russia and the Assad regime seem poised for victory. But there are hundreds of thousands of lives at stake. As Mr Trump has emphasised.